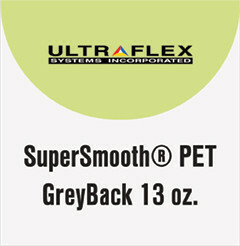 SuperSmooth™ PET GreyBack is a 13 oz. non-curling banner with a super smooth print surface and a grey back. Ideal for high resolution printing. Grey back-side prevents light transparency and shadowing. Ideal solution for pop-up, roll-up, x-displays and an array of close viewing indoor applications. Compatible for use with solvent, eco-solvent, and UV printers. Available in widths from 38” - 126”.